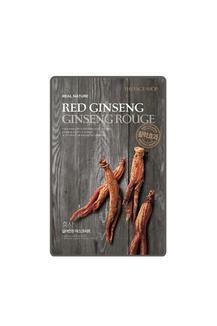 Real Nature Red Ginseng face mask drenched with emulsified moisturizing serum from the house of The Face Shop. It contains revitalizing red ginseng which provides skin with a boost of energy and vitality. The rich extracts with revitalizing properties, even tones complexion, removes dead skin cells and provides energy to the skin. Add energy and vitality to the skin with this Real Nature Red Ginseng face mask.